The Verge has an interview with Peter Thoman (AKA Durante), a modder who has been releasing fixes for the PC version of Dark Souls. About a week ago, he began to think about how the resolution might have been locked and how he might go about circumventing the limitation. He hypothesized that the game would use the DirectX 9 application programming interface (API). If he could insert something that intercepted the call between the game and the API, he might be able to override the resolution limiter. So without access to the game, Thoman began to experiment with other games that used the same DirectX 9 API. He created a logging framework that tracked DirectX operations, and made adjustments to the resolution based on entries in the log's output. 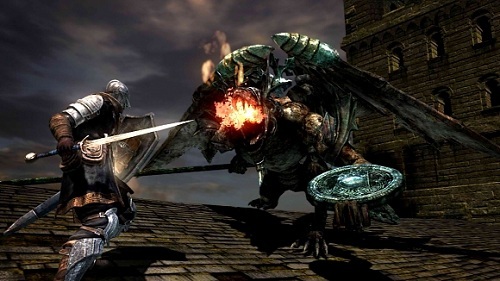 When he got his copy of Dark Souls, he put his experiments to the test. He played the game for about a minute, and opened the 100 MB log file that his framework had created. Thoman found parameters referencing the 1024 x 720 resolution, tweaked them, and routed them through his framework instead. Some parts of the article are already outdated, for example Version 0.4 fixes depth of field and allows the mouse cursor to be hidden. Good for him. It's how Tripwire interactive got its start. Originally I was going to just get the PS3 version since it is the superior version I had heard once the word on the street was the PC was a turd. But due to this guy, I may just go with PC after all. Just going to hold off until he works through a few things. From should cut this guy a check. So the game is broken? The game locks the 3D rendering to 1024 x 720, not even 720p which is 1280×720. This guy unlocks it to scale with your display size (you can even make it large than that and supersample). It looks much, much better now, still feels a little clunky to me, but I guess that's more a control thing. So after all the hype, the "Prepare to Die" Edition, priced at $40, is a clunky, poor port of a year old game. I'd laugh if it weren't so tragic. Ah what the hell, I'll laugh anyway! That is why I love PC gaming ... you can play and change it to better suit. I guess I'll pick this up when the patch is better. Are you playing it on a PC? Then the answer is yes. Just watched Batman Beyond: Return of the Joker the other night, and I will say Mark Hammil used that line to good effect. I used it in a business meeting once! Business meetings aren't complete without capt. clown. I am saying this with a giant smile on my face. It is 40 bucks. You cheap motherfuckers. Us console "peasants" got it at full price because of the gameplay... Are there really only 4 PC gamers that enjoy gameplay over graphics? Furthermore! Where is the interview with The Man Who Sold the World? The game looks awful without the resolution fix, it was actually hard to tell what I was looking at, everything was blurry and pixelated. The console versions probably look better than the unmodded PC version. As for only 4 players...it peaked at over 10,000 concurrent players on Steam today. It's a yea old, an apparently broken! Come on! I'll weigh in. I've been playing it without the mod. I am unsatisfied with the graphics but I knew what to expect going in. Currently the mod crashes my game every time. Tried all the fixes. Honestly what makes me upset is the target lock on. Lock on with mouse and keyboard is bad, really bad. I ran into the same thing - using a large monitor really makes the locked resolution painful to look at. The fix for this really changed the game IMO. If you don't use a controller for this - the key/mouse controls are possibly the worst I've ever seen for a PC game. Get a controller... hopefully this will change now that its on the PC - time will tell I guess. It's hard to fault the devs for the trouble since they've been clear from day 1 that this is going to be quick and dirty - I blame the publisher for not giving them the time and money... but it really does make you wonder how someone (obviously talented) was able to essentially make the game PC quality in terms of GFX. I prefer gameplay - but who doesn't like the best of both worlds if you can have it?